The City of Carrollton has named Derick Miller as the new Carrollton Chief of Police, effective November 20, 2017. Miller currently serves as Carrollton’s Assistant Chief of Police, and will succeed former Chief Rex Redden, who was named Executive Director of Public Safety in September. A national search was conducted, garnering more than sixty qualified applicants including experienced chiefs and law enforcement professionals vying for the position. An internal assessment center comprised of four interview boards: the City of Carrollton Executive Team, a panel of Department Directors, the Carrollton Police Officers Association, and a Police Chief panel comprised of the chiefs from Addison, Farmers Branch, and Coppell was held on Monday, October 30 for the top three candidates. “I am excited to announce that Derick Miller has been selected as the next Chief of Police for the City of Carrollton. He has earned the respect and confidence of his colleagues within CPD and in the broader community. His deep understanding of Carrollton Police operations, his long-standing commitment to the city of Carrollton, his proven leadership, and his vision for the future of the organization makes him an ideal choice to lead Carrollton’s finest,” said Mayor Kevin Falconer. Miller began his career with the Carrollton Police Department in September 1993 as a Police Officer, and has worked his way through the ranks and served in almost every aspect of the police department throughout his career. 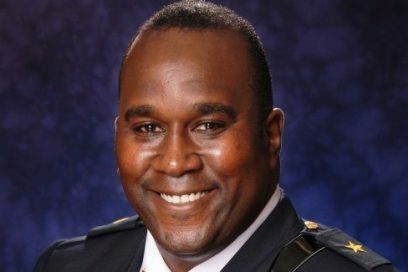 He holds a master’s degree in criminology and criminal justice from the University of Texas – Arlington, is a graduate of the FBI National Academy, the Senior Management Institute of Policing, the Institute of Law Enforcement Administration, and holds a Master Peace Officer’s Certification from the Texas Commission on Law Enforcement. Miller is a native of Benbrook, Texas and came to Carrollton in 1992 as a reserve officer before hiring on as a full-time officer in 1993. He lives in Carrollton along with his wife and two children. “This is an honor and privilege I could only dream about when I was embarking on my law enforcement career as a rookie Carrollton Police Officer nearly 25 years ago. I am truly honored to have been selected to lead such a progressive organization in the city that I am grateful to call home,” said Miller.